Play for your Free Spins treat! 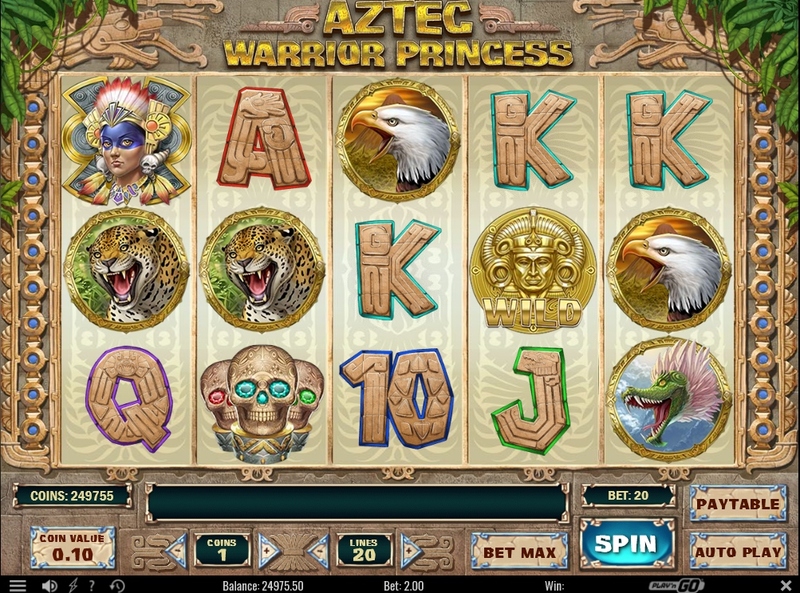 Earn up to 50 Free Spins on Aztec Warrior Princess! If you’ve been dreaming about forgotten treasures and hidden cities made out of pure gold, dream no more, because you’ve just found it in the Aztec Warrior Princess slot. Put on your khakis and get ready for a quest to El Dorado. Explore mysterious Aztec temples crawling with creepy bugs and local wild life but nothing can stop the warrior princess from helping you discover big cash rewards and wins up x5000 your line bet. Find out about this week’s hottest instant win game, jam-packed with the most exciting action and phenomenal prizes. This week, unlock up to 50 Free Spins on Aztec Warrior Princess when you spin the reels with a minimum bet of €0.20 per spin. – Reach the free spin mode once during campaign period and receive 10 Free Spins. Only one amount of Free Spins per player based on how many times the bonus round on Aztec Warrior Princess is triggered. Free Spins will be credited on 26th May 2017 and are valid for 14 days. Winnings from them have to be wagered 40x within 14 days, subject to the Eurolotto bonus terms and conditions. Set in an Aztec inspired game window with scarabs crisscrossing the screen, Aztec Warrior Princess comes with sharp graphics, seamless animations and a very fitting mythical soundtrack. The game is a 5-reel, 3-row, 20-pay lines (variable) video slot with Wild substitutions, an Aztec Temple Bonus feature and a Free Spins round. A TRTP of 96.08% coupled with rather high pays for 5OAK and a top win of 1,000x bet in the bonus game are putting this slot into the medium variance category. Stake sizes range from $0.20 – $25 which can be adjusted by a click on the current coin size and/or the amount of coins from 1 – 5.